Two friends can be in love with the same man; but it is a bad story for cousins or even sisters and in this case, a mother and her daughter to romantically be involved with the same man. This is not strange news though. We have heard stories of mothers marrying their daughter’s ex-husbands and more cringe worthy stories that surface from all over the world. 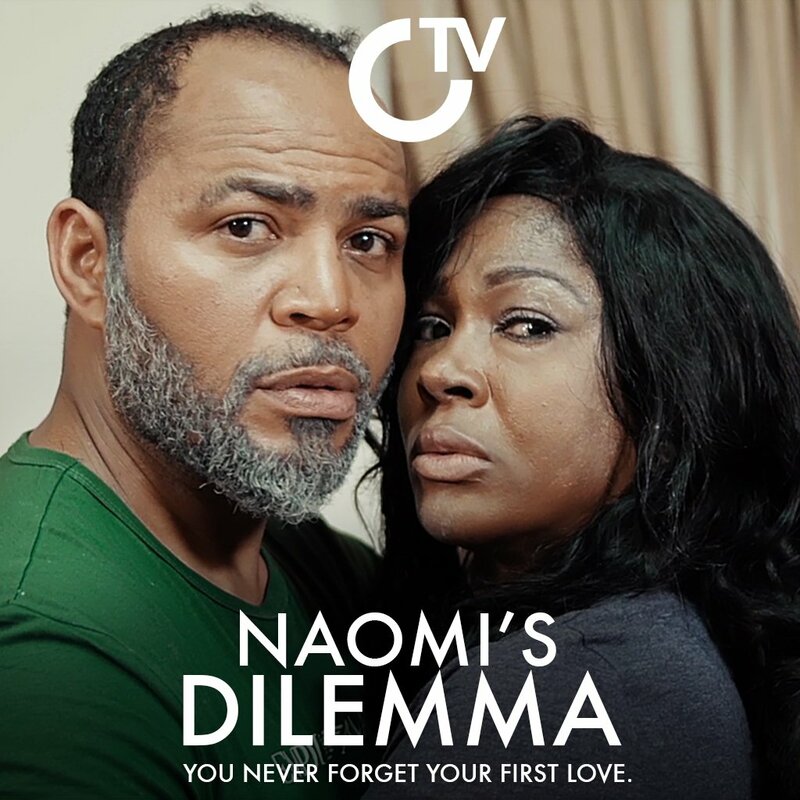 Naomi’s Dilemma is Iroko TV’s latest release and an exploration of the topic. Segun (Ramsey Nouah) and Naomi (Susan Peters) were lovers at a young age. Class status leads to a separation for the two and while Segun travels abroad to gain a certificate (this is also his mother’s way of separating the two) Naomi stays back and trains her young daughter. The daughter is not Segun’s though. It is only a matter of time before the two get connected again, and this time, they do so via Kiki (Bimbo Ademoye). Kiki is Naomi’s daughter, and she brings Segun home as her boyfriend. When he meets Naomi again, feelings are rekindled and they start a relationship on the side while ignoring Kiki. The writer’s intention is to communicate a love story worthy of admiration, but that is also where the trouble of Naomi Dilemma starts. There is no proper establishment of characters and Naomi who appears very rude to us from the first scene is softened by the presence of Segun. This is of course communicated as love, but the writer also forfeits the love Naomi should have for her daughter, in a bid to establish a romance story between Naomi and Segun. There is no sensitivity from a mother that is portrayed to us as a woman with a good heart. Maybe love challenges good people, and they lose their best because of it, but the writer does not insinuate this. She creates a Naomi that is eager and a hungry woman for Segun and that is the only establishment we get. They hide their romance and deceive Kiki while at it; while the mother enjoys herself with the same man her daughter is in love with, the daughter cries and struggles with esteem issues because she was dumped. Some of the cliché scenes in this movie also make the attempt at playing with the emotion of the viewer unforgettable. We watch scenes where Segun drops Naomi at the front of her house while Kiki waits for her mother inside, these scenes should have some essence of believability but unfortunately, they don’t, this particular scene jokes with our emotions too deeply, and wrongly too. We are careful not to tell a writer how they should tell their stories, but we can suggest better ways to create stories that we think as viewers we will receive better. A story on a mother and daughter in a love triangle is not cool, and we know art is not meant to always please us, but we should be able to take a thing or two home. With this, we don’t. Despite the story, I love the actors in Naomi’s Dilemma. Susan Peters needs to be in more films because clearly with age, her acting has also matured, and it does not hurt that she is a very beautiful woman to watch. There is an error in the credits, Susan Peters is written as Susan Patrick – Susan Patrick is a different person. We miss her but this is Susan Peters, and there is no excuse for such an error. Ramsey Nouah plays the kind of role that launched him to prominence and he does an incredible job of it. Bimbo Ademoye is lovable and there is hardly an actor that comes on screen that will leave you unimpressed. The actors make this enjoyable even if we cannot find pleasure in the story; we can enjoy the people interpreting this story. Rejoice Abutsa is a 22-year-old aspiring Filmmaker and a big dreamer. She’s also a ‘Theatre and film’ arts graduate from the University of Jos, Nigeria. Hello Anna, I can’t recall the song. Maybe I’ll ask the director.